This piece was basically an attempt at “humanizing” computers. 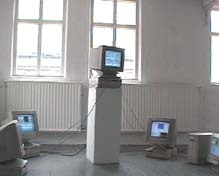 In this piece I have five networked computers, one of which is the choir director and composer and the remainder forming the choir. The director is composing the music as he goes along but it’s not purely random. This choir has a sense of aesthetics, so the director is very critical about the notes he chooses. Though he examines the possibilities of all notes, only notes fitting within a certain scale are actually accepted. Upon accepting a note, he randomly chooses a choir member, sends the note over the network and on the choirmember screen a mouth opens and we hear the note. The whole arrangment is based on making the computers look somewhat human and behave accordingly. The piece has been exhibited three times, once at the the Living Arts Museum in Reykjavik, once at the NIC2001 conference exhibit in Copenhagen and once at the Atlantic Cultural Spaces conference E-lounge in New Brunswick, Canada. The first time I exhibited it, I used a bunch of old Macs and I must say that the “humanizing” effect worked out best with them. The choir was arranged in a circle gazing upward at the director who was on a pedestal. It was quite serene, almost religious. But the computers had a really tough time handling everything. I ended up having to display the singing “mouth” in a tiny little window. At the other two exhibits, I used iMac’s. These handled the graphics quite well and the “mouth” was displayed full-screen. However, the over-all impression was not quite as good. The iMac’s were a bit too “clean” and lacked “personality” and “character”.